Amazon * Barnes and Noble * Indie Bound * Books A Million * Kindle * Bookclub * Nook * Books On Board * HQ * Audible * Kobo * Walmart * Target * Book Depository w/worldwide shipping * Indigo * iBooks * iTunes * Schwarzes Geheimnis * EL SECRETO M?S OSCURO Though they carry an eternal curse, the Lords of the Underworld are irresistibly seductive—and unimaginably powerful… Don’t miss a single book in this stunning paranormal series from New York Times bestselling author Gena Showalter! Keeper of the demon of Secrets, Amun can manipulate the darkest thoughts of anyone nearby. 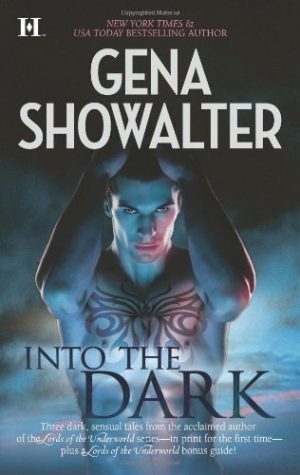 But when the immortal warrior is chained and isolated to protect those he loves, death is his only hope of release—until he meets Haidee, a fellow prisoner whose beauty and hidden vulnerability draw him into a reckless test of his loyalty…. Haidee is a demon-assassin, raised to despise Amun’s kind. Yet how can she hate the man whose touch sets her aflame? But to save him, she must give herself body and soul…and face the wrath of a powerful adversary sworn to destroy her. 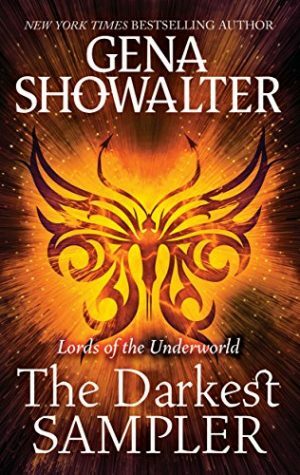 Book 7 of Lords of the Underworld. ** An excerpt: Amun experimented with his range of motion, lifting one leg and rotating his ankle. He grimaced, then repeated the process with the other leg. He grimaced again. Both legs fell back onto the mattress with a hard thump. The bones had woven back together, but they were still fractured. “Whoa.” Strider pushed to his feet, the chair skidding behind him. “What the hell do you think you’re doing? Lie still. You’re recovering.” Amun hardly ever despised his inability to speak. Silence was his choice, but just then, he wanted to shout – the girl, where the hell is the girl – uncaring that the moment he did, all the secrets inside him would spill out, hurting everyone who heard them. Not physically but mentally, and that was a far worse pain to bear. He knew that very well. Amun could deal because he’d spent thousands of years learning to distance himself from the visions and voices in his head, blocking emotions before they could even form. Not this newest onslaught, of course. He’d never experienced anything like this, and had no idea how to cope. Had no idea how he was lucid now, the new demons cowering in the back of his mind. Unless . . . Haidee. Her name whispered through his mind, a plea, a prayer. His desperation to find her intensified. He threw his legs over the side of the mattress, hinges squeaking. Every muscle he possessed knotted and ached, clamping tightly on those fractured bones. “Amun, d*** it. You’ve been bed-bound for days, recovering from your wounds and our little experiments. Stop before you — ” Agitation somehow making his motions fluid, he twisted to face his friend. Most of what Strider had said confused him, but he left it alone. He jerkily signed, I’m sorry I hurt you. Sorry I challenged you before. But I have to find her. Where is she? If they’d hurt her, he didn’t know what the hell he’d do. Strider sat back down and said, “She’s there.” His tone was hard and unbending as he motioned to the left with a tilt of his chin. Amun followed that tilt with his gaze, and hissed in an agonized breath. She was on her knees, her arms chained above her head. That chain was anchored to his ceiling, offering just enough slack to keep her spine erect. Her head lolled forward, her chin pressed into her collarbone. The length of her pale-and-pink hair shielded most of her dirt-smudged face, but he could see that her eyes were closed, her long, curling lashes fanning down. His lips parted in a silent roar as he at last pushed to a stand. His knees almost gave out, his stomach almost rebelled, but fury and reckless determination gave him strength. “I drugged her,” Strider said to prevent a violent burst of temper. “She’ll recover.” That didn’t matter! What mattered was that something had been done to her. How long had she been tethered like that? Unconscious? Helpless? Amun stalked to his friend, stumbling twice, and held out his hand, palm up. Secrets began prowling restlessly. Because they were closer to the girl? Strider knew what he wanted, and shook his head. “She’s a Hunter, Amun. She’s dangerous.” No, she was the best thing that had ever happened to him. He waved his fingers, insisting. He would challenge Strider if necessary. Would do anything for what he wanted. “Damn it! Do you care nothing for your own safety?” Again he waved his fingers. “Fine. You can deal with the consequences on your own.” Scowling, but perhaps sensing the depths of Amun’s resolve, Strider reached inside his pocket and withdrew a key. He slapped the metal into Amun’s still open palm. Immediately Amun spun and stomped to Haidee. He tripped twice more along the way, but not even that slowed him. Secrets, he noted, had ceased prowling, was utterly still and completely silent now. Only those years of blunting the fiercest edges of his emotions kept his ire inside as he twisted the key into the lock. The metal unsnapped, freeing her. She sagged forward without a sound, arms falling heavily to her sides. She would have kissed the floor if Amun hadn’t caught her. His arms despised him, sharp pains still shooting through him, but he didn’t care. 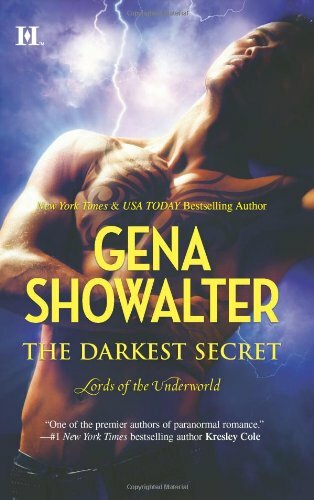 At the moment of contact, the screams inside his head – muted though they’d been – quieted altogether, the demons determined to hide from her, as if they feared the pulling would start up again. Gently, so gently, he fit her against his chest and lifted her into his arms. The chill of her skin delighted him anew, and he couldn’t help but remember the glide of that skin against his, caressing, stroking, the friction unbearably sweet. Raw desire, brutal in its intensity, suddenly consumed every inch of him. He fought past that clawing need and carried her to the bed. He eased her down, then fit the covers around her slight frame and peered down at her. How fragile she looked, her cheeks a bit hollowed, her lips chapped, her skin pallid. How vulnerable she was, unable to defend herself from any type of attack. She would hate that vulnerability, he thought, not needing his demon’s help to recall the way she’d constantly scanned her surroundings, how she’d vigilantly searched for a weapon. How she had defended him with her very life.